A graph $G$ is a simply connected planar graph, all of whose regions are bounded by $6$ edges. How do you prove the degree of vertex in $G$ is most $2$? consider this planar graph $G$ which every region in it is bounded by $6$ edges yet there is two vertices with degree $3$. hope you see what you are looking for. If $G$ is a finite, simple, connected plane graph, and all of whose regions are bounded by $6$ edges, then it has at least one vertex with degree $\le 2$. This follows from Euler's polyhedral formula: $$ V+F = 2+E $$ When all faces are hexagonal, we have $E=3F$ and therefore $$ V = 2+2F $$ On the other hand the sum of the degrees is $2E=6F$, which is not enough to give each of the $2+2F$ vertices degree $3$ or more. “Every planar graph has a vertex of degree at most 5” So what's wrong in this case? Proving that $G$ has a vertex of degree at most $3$ for planar graph. 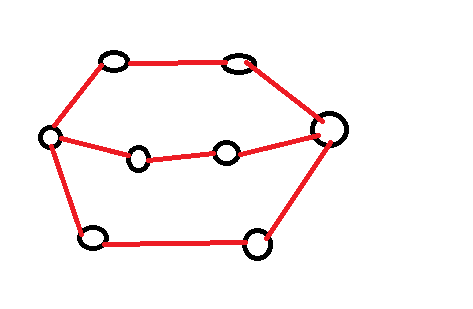 Why does a connected planar simple graph has a vertex of degree at most five?